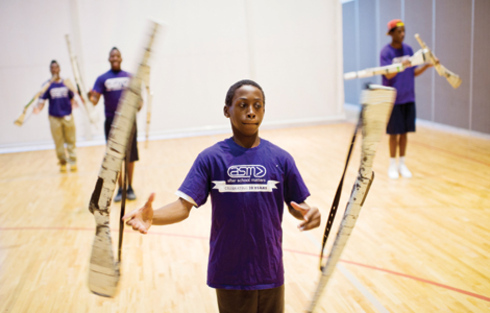 Since its founding, the South Shore Drill Team and Performing Arts Ensemble has made education its focus, using performance to orient youth away from negative influences and toward academic success. Photo by Marc Monaghan. In his formative years, nothing excited Arthur Robertson more than marching. Tightly coordinated dance moves, flags twirling wide circles in the air, and the hundred spin tosses of wooden rifles and sabers drew him into precision drilling at age 12. Robertson went on to become a teacher and student dean at Paul Revere Elementary in the Greater Grand Crossing neighborhood, but his marching experience never left him. He eventually decided to begin a local drill team, now known as the South Shore Drill Team and Performing Arts Ensemble. With 325 youth currently enrolled—a number unthinkable at the time of the team’s four-person beginning in Robertson’s mother’s basement—the team achieves in areas that many organizations attempt but few deliver: retention, parent involvement, crime prevention, a 99 percent high school graduation rate and developing positive self-worth. Most members of the team reside on the Southeast Side where violence and poverty have been constants for too long. A commitment to daily after-school and early Saturday morning practices keeps the youth busy, and its military structured training is accompanied by strict codes of behavior ranging from no gum chewing, 10 or fewer days of absences at school, and swearing off gangs and drugs. Maintaining the drill team is not easy, but it is a necessity in Robertson’s eyes, because it provides youth with the emotional and material support needed to break the cycles of poverty and violence in order to determine their own future. The drill team practices in a newly donated community center, located just around the corner from Paul Revere. Students are divided by gender, age and ranks, and each group has its own instructor directing its every move. Precision is key. On cue, students’ stomps, claps and shouts fill the silence kept between routines. Discipline, Robertson believes, can be learned creatively instead of punitively: The tighter the act, the better the performance, and the louder the cheers. The team participates in more than 100 events a year, and it was crowned as the champions of Winter Guard International last year. The Chicago Reporter sat down with Robertson to talk about his team. What motivated you to begin the drill team? I started it, for one thing, to give back, but I was also doing it because my nephew always liked to watch me marching. I would teach him small routines, but one day he and three of his friends learned something, and they asked me to look at it. It was on the block where we lived, so really one of the reasons why I started the drill team as an idea to keep the kids off the streets by giving them something constructive for them to do with their spare time after they come home from school. Has the character of the youth that you serve changed since 1980? I think it has changed since I first started because now we’re dealing with … almost a different breed of children. These kids don’t fear anything, and sometimes that becomes a challenge. If we don’t keep something that is going to sustain their interest, then most likely we won’t have them. So we are always doing different things, changing—choreography changing, trip changing, changing recreational activities to keep them interested. We are just not standing still. Once we get one problem solved, there is always something else. And, one thing with kids, if you want to keep them interested, you have to stay a step ahead of them, so we are always trying to come up with new ideas to keep them interested, and we always ask the kids for their participation so when you see the kids performing some of the routines, it is not just the input of the instructors that you are seeing—they have input in what they are doing as well. Why do you think that the drill team encourages its members to excel in school? Well, nowadays, I think that kids need more than just academics; they need something to keep them doing something constructive. When children join the drill team, they don’t know that the sole purpose is to keep them doing positive things. They just see the excitement, I guess, and that excitement is generated by being part of a team. If we tell them, ‘Join the drill team, and we’ll make you a better young man and young women,’ I don’t think they would want do it, but that’s what it’s really all about. The team has ‘performing arts’ as part of its name. Is there anything about the arts that further motivates the kids? I think there is something more about the arts because it gives them the opportunity to not just drill but to dance, to show expression and to be creative with what they are doing. They are taught more than just drilling, because drilling is just part of it. But the arts part of it is also exciting because it’s not just music that we select but some of the things and some of the music that they like. Why the focus on boys and young men? The emphasis is on young men because of the violence—because most of the violence is done by young men, and most of those receiving the violence are young men. Look at the news, and you can see the negativity surrounding them. Much of the team’s attention is on the young men because we are trying to save them, you know. We have some girls with problems, but the number of problems are nowhere near the number of men who are doing negative things. How do you understand the idea and use of discipline creatively? Well, everyone wants to be part of something, and by the drill team having the recognition that it has, kids want to be a part of it. With that being said, the drill team gives them an opportunity. Everyone want to shine, so by kids seeing the drill team perform, they feel they want to be a part of it, and they know that in order to stay a part of it, they got to do certain things. That’s not to say that kids don’t get in trouble in school, or that kids do their homework all the time. Every week, almost, we are dealing with a different child either dealing with something they are going through at home or something they are going through at school or even something that they are going through on the streets, but you know, we nurture kids. We offer mentoring, and we offer guidance for these kids. It’s almost like a second family or a home away from home to them, and that’s what, usually, a lot of inner city and a lot of disadvantaged kids don’t get. And we also give them a chance to travel and go through the drills with their unique style of performing. Do you think the drill team acts as a form of social change? It definitively is. The reason I say that is because we have kids who are first-generation high school graduates at the same time we have members who are first-generation college students. So with that, that is how we are making the change. Now, I think we have 12 kids in college, but it’s not like it is something that is pushed on them. It is something they are recognizing and realizing on their own that, if they want to live a comfortable life, there are things they have to do. What do think the drill team tells their audience about the youth performing? I think that the organization itself is telling people something different about the kids. When people look at our kids and they are yelling and screaming, I don’t think that they are yelling and screaming at their actual performance. What people are seeing is a bunch of young men, disadvantaged young men, doing something constructive together. What future do you hope for this program? Where I would like the program to go is endless. We have one organization in the City of Chicago, but why not have several? We are doing a lot of events in the Chicagoland area, and we do have events out of state, but why not have many more? Why not be part of a major movement?